These are valid questions. In short, YES chiropractic is safe for babies/newborns with chiropractors who have been trained in pediatric chiropractic techniques. And NO, babies do not get adjusted the same way as adults. A baby’s joints are more cartilaginous than bony and only require about the same amount of pressure as you would use to check the ripeness of a tomato. Why should an infant get checked by a chiropractor? The birth process can be traumatic for an infant and can cause spinal misalignments. Spinal misalignments that are left uncorrected will impact your baby’s spinal growth and development, reducing the healthy function of his/her nervous system. In some cases, a spinal misalignment will manifest in visible symptoms immediately. However, in many cases, infant spinal misalignments may not present any visible symptoms until later on in life. This is why ALL babies would benefit from getting checked by a chiropractor. Getting your baby’s spine checked by a chiropractor ensures that your baby’s spine is healthy right from the start! The causes of colic can be from gassiness to abdominal pains to reflux. In essence, the newborn is experiencing some type of symptom and the only way they know how to express their pain is by crying. If your newborn prefers to keep their head turned to either the left or the right, it is a clear sign that the infant has a misalignment in their upper neck area. One tell-tale sign of this is if the newborn favors one breast over the other while breastfeeding. While this child may not have any overt symptoms such as being colicky, it is wise to ensure this child has his or her spine checked from a preventative standpoint to correct any underlying problem that may arise in the future. 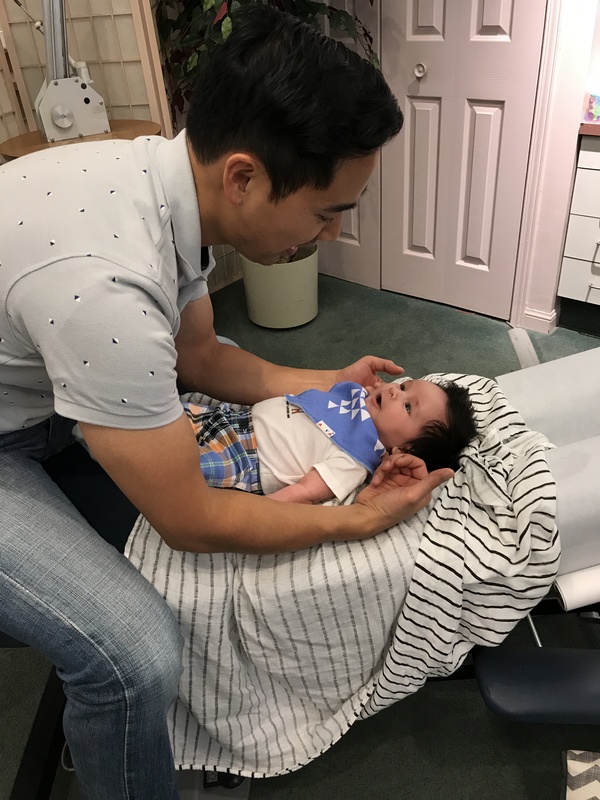 As a father of two beautiful girls, who both got their first chiropractic adjustments within hours of being born, the spinal health of infants and children is particularly close to my heart. We love helping babies start life on the right track with a healthy spine and nervous system! If you have an infant and are looking for a natural healthcare alternative, contact us at Health & Healing Family Chiropractic for a free consultation. The short-term effect of spinal manipulation in the treatment of infantile colic: A randomized controlled clinical trial with a blinded observer. Wiberg, Jesper M.M. et al. Journal of Manipulative & Physiological Therapeutics , Volume 22 , Issue 8 , 517 - 522. Infantile- colic treated by chiropractors: a prospective study of 316 cases. Klougart N1, Nilsson N, Jacobsen J.J Manipulative Physiol Ther. 1989 Aug;12(4):281-8. Efficacy of Chiropractic Manual Therapy on Infant Colic: A Pragmatic Single-Blind, Randomized Controlled Trial. Miller, Joyce E. et al. Journal of Manipulative & Physiological Therapeutics , Volume 35 , Issue 8 , 600 - 607. Chiropractic care of a pediatric patient with symptoms associated with gastroesophageal reflux disease, fuss-cry-irritability with sleep disorder syndrome and irritable infant syndrome of musculoskeletal origin. Joel Alcantara, BSc, DC1 and Renata Anderson, DC. J Can Chiropr Assoc. 2008 Dec; 52(4): 248–255.